Are you contemplating a DIY kitchen renovation? We have recently completed a kitchen renovation of an older house we own. The house was tired and in need of an update. Here is our kitchen renovation story and what we learnt along the way. This home was built in the 80’s and had a kitchen to match. The old kitchen was very dated, with dark beige cupboards and dark kitchen tiles. We didn’t want to move any plumbing in the kitchen and we planned the new kitchen with this in mind. This was a small kitchen and we not only wanted to create a light and bright space but we wanted to open it up as much as we could. We chose a Bunnings Kitchen as we had a budget in mind and we had a time frame planned for the renovation to be completed. This suited us rather than having a custom made kitchen installed and having to wait longer. A point of difference that was included in this kitchen was the soft close mechanisms on the drawers and doors. We chose a Kaboodle kitchen from Bunnings. I loved how Bunnings came out and measured up the kitchen and benchtops and provided suggestions on the design. There is a fee for this first consultation which was $99.00 and comes off the cost of your kitchen after you place an order. But well worth it. Bunnings will take all of your measuresments for your kitchen cupboards and benchtops, leaving space for your appliances. The benefit of them taking all of your measurements is that you will have no mistakes and everything will fit into place. Bunnings also provided drawings of the kitchen and what it would look like, so you get an idea of what your design looks like up front. You can design your own kitchen with the Bunnings kitchen planner and plan the perfect layout and find inspiration for your own kitchen or you can just get a consultant out to do it for you. It was a bit daunting dismantling the original kitchen. 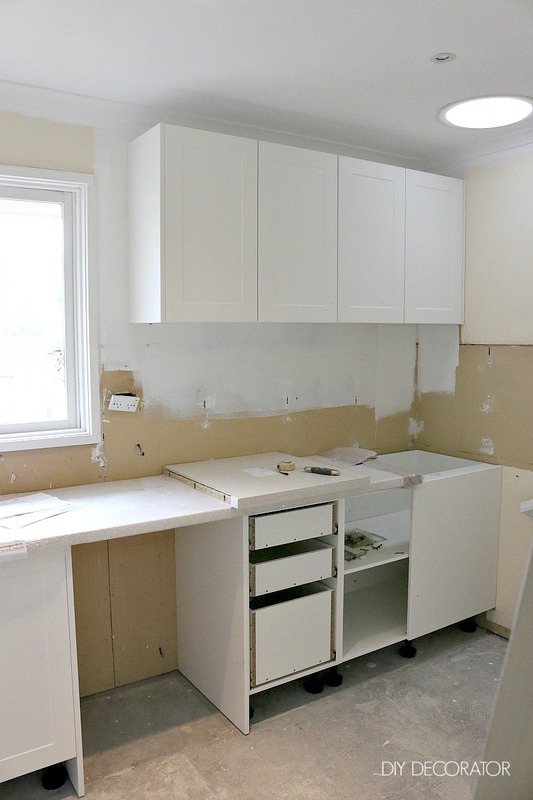 We’ve never done a renovation like this before, where you are completely gutting the kitchen and starting again. We removed the floor tiles with a rotary hammer with a chisel bit attachment. It was really hard work. Our kitchen was delivered to the home. Kaboodle kitchens provide you with video instructions on how to put the cupboards together and attach the bench tops. My husband put the kitchen together in an afternoon with the help of a friend. They found it really easy and straightforward. We were told the hardest bit would be getting all the cabinets in straight and even. This was no problem. The hardest part was lining up the new cabinets with the existing plumbing and accurately cutting holes in the cabinets for the plumbing. We followed the kitchen plan to place and assemble the cabinets. Once all your cabinets are assembled and in place you can screw the cabinets into your timber stud wall using a minimum of 65mm timber screw. Once all the cabinets and spacers were in place this meant we were able to slide the stove into place. To install the overhead cabinets with the aid of cabinet supports (not included) align cabinets and hold together using clamps. Australian standards state that the distance between the benchtop and wall cabinet needs to be a minimum of 450mm. Everything is predrilled and easy to align when installing the cabinet doors. They give you a template to guide you where to drill the holes for the knobs. I finished the kitchen with a simple laminate timber flooring treatment from Carpet World in Mornington. I was really happy with my choice of colour and the finished product. I had a budget to stick to and this was perfect. The cost was $27 per square meter and another $27 again to have it laid. Carpet World installed the strip around the edge to finish off the flooring where the floor meets the cabinets. For the splash back we chose subway tiles that were 300mm x 100mm in white. The tiles came from Stone & Tile in Mornington and cost $30 per square meter. Finally we painted all the walls and window trim in Dulux Vivid White. The walls took three coats of paint to cover the old paint. It was fairly straight forward. We changed all the window wind out mechanisms from brown to white. These are just small touches that can really make a difference to updating an older home. This was just a small kitchen in a tight space but we managed to fit in the sink, a dishwasher, cooktop and storage and even though we couldn’t center the stove/rangehood like I had originally wanted, I think the end result is great. Kitchen walls are painted in Dulux Vivid White which worked well with the white subway tiles and walls. We really enjoyed renovating this house and my husband and I worked so well together. We hope this helps you if you are planning a budget DIY kitchen renovation. If you’ve recently renovated your kitchen, we would love to hear your renovation story. Email us or tag us on instagram.